As a young girl in England, I was surrounded by textiles. My grandmother was a seamstress at Buckingham Palace and was responsible for finding and sewing all the fine embellishments (especially lace) onto the ball gowns. This connection to textiles stayed with me after my family moved to Canada. 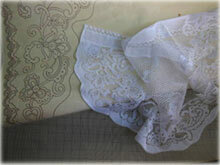 Growing up, my dressers and drawers were always overflowing with lace trims, table pieces and curtains. In the mid-1980s, I launched Highland Lace and began traveling to Scotland to search out the old mills that still produced traditional lace curtains and trims. There, I went through the archives and found patterns dating back to the mid 19th-century, which inspired some of my own designs. Highland Lace has since expanded to include lace curtains from around the world, linen curtains, and repurposed textiles such as our vintage kimono and sari eye pillows. I hope our collection will help to create your own connection to the rich world of textiles. We welcome custom orders, and we ship world wide.